Dave is originally from Cheshire, but has been living in Vichy, France, for 6 years now, working as an English language teacher. He's also had a variety of previous jobs, including academic writer/researcher. Dave has had a wide variety of experience in the arts, including music, drama, film-making and poetry. He has acted in numerous stage productions since the age of ten, including two plays in Switzerland. He has performed in works by Shakespeare, Brecht and Tennessee Williams, among many others. He has made 7 short films and written 4 feature-length screenplays. He has written 3 collections of poetry, and recited his anti-war poems at activists' events. He began to write songs from an early age. He composed his first pop song, "Maybe", at twelve. In recent years, Dave has been more focused towards being a professional singer/songwriter. 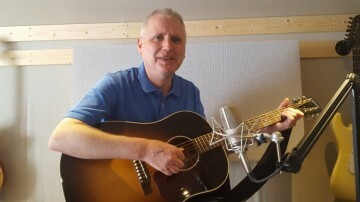 He has recorded a 3-song EP, 'Dreamclouds', with Big Cloud Productions in Liverpool, produced by his friend Steve Stroud, 'Hey There Sammy', a song for his young son, produced by his uncle, Martyn Barker (of Shriekback fame), and 'Our Whingy Gayle' and 'Clothes You Wear', both also produced by Steve. All of his studio-recorded songs are now available on YouTube, for which he created his own music videos. Please contact us at Jack Russell Music if you would like to use any of Dave Barker’s compositions for film, television, electronic media or covers.